This magnificent dish is gourmet-on-the-go and takes minutes to prepare and has been one of Holly Clegg's most popular salmon recipes. This recipe is from Holly Clegg’s trim&TERRIFIC Eating Well to Fight Arthritis cookbook. 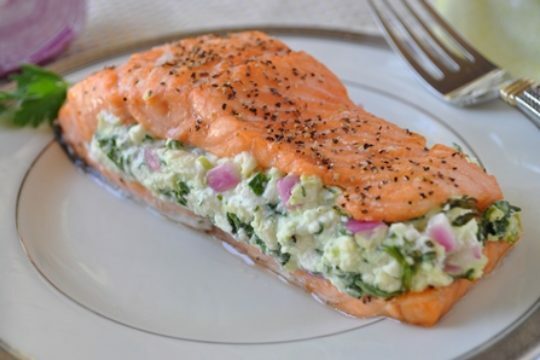 In bowl, combine cream cheese and feta with fork, mSixing until blended. Add onion and spinach, combining well.